Labrador retrievers are the quintessential dog, loved by both families and hunters alike. Indeed, for more than 24 years the Labrador retriever has been the most popular breed in the United States, per the American Kennel Club. This trend is seen in the UK as well, as the UK Kennel Club reports the lab has the highest registration numbers of all gun dogs. Incredibly versatile, the Labrador retriever can be used in the field, but also in settings such as Seeing Eye and therapy dogs, as well. Regardless of the universal love of labs, most of the world (particularly hunters) are divided. Some prefer the British lab, while others decidedly love the American lab. The difference between these two types of retrievers will be described here. The British (or English) Lab has a stockier build than its lanky, American counterpart. A British Lab stands 21.5 – 22.5’’ tall, while the American Lab stands taller at 21.5 – 24.5’’ at the shoulder. The British Lab has a wider build with a fuller chest, thicker neck, shorter legs, and a more clearly defined forehead stop. The American version, on the other hand, has a narrower head, longer legs, longer muzzle, and a more agile build. Whereas the British Lab is built like a rugby player, the American Lab looks more like a track athlete. An easily distinguished feature of the American Lab is the tail, which is frequently thinner and tends to curve upwards. The British Lab, on the other hand, has a tail that is thick and straight. British Labs have denser coats, but commonly weigh less than American Labs. Male British Labs range 70 – 74 lbs (females top out around 55 lbs) while American Labs often weigh 10 – 20 lbs more. Of course, there are plenty of similarities between the two types of Labs. For instance, both have water-resistant double coats. There are three recognized colors of Labs: black, yellow, and chocolate. For both the British and American Lab, the black coat is most common. Interestingly, there are fewer chocolate British Labs than American ones. From a temperament perspective, there are a number of differences between the two types of dogs. British Labs have a tendency to be calmer, quieter, and less active than their American counterparts. However, American Labs tend to have more energy and a greater hunting drive. Despite these differences, both types of Labs have the same origin, which is the Newfoundland St. John’s water dog. This breed was used originally used for helping pull fishing nets back to shore in the 1800’s. While the UK and US recognized the breed at different times (1903 and 1917, respectively), neither governing body recognizes a difference between the two Lab types or lineages. How did the differences between the two types of Labs arise? The difference stems from geographical differences in training and hunting. For instance, British field hunting history involved large events involving hundreds of birds over the course of many days. For these large scale shoots dogs were expected to be quiet, controlled, and excel at finding game. In America, the Lab’s job description is slightly different. Here, more versatility is required due to differences in region, climate, and game species. The European-style shoots led to hunt tests and field trials in America, which required a decidedly more athletic dog with a stronger drive. As a result, the physical characteristics of the Labs bred in America changed in order to fit these needs. At the end of the day, there are few differences between what the two types of dogs can accomplish when well trained. During late season hunts, the enhanced drive of the American Lab can be advantageous, but overall the two dogs are more similar than most people realize. Some people believe that British Labs are easier to train due to their calmer demeanor, but that point is often hotly debated because a softer dog might not take discipline as well. Overall, both types of Labrador retriever makes a great family dog. When purchasing a Lab, British or American, health should be the most important focus. Breeders should stress eye, hip, and elbow health. Hunters should also do their research and find the breeder whose dogs most closely suit their needs. Some breeders produce dogs for the show ring, while others for the field. 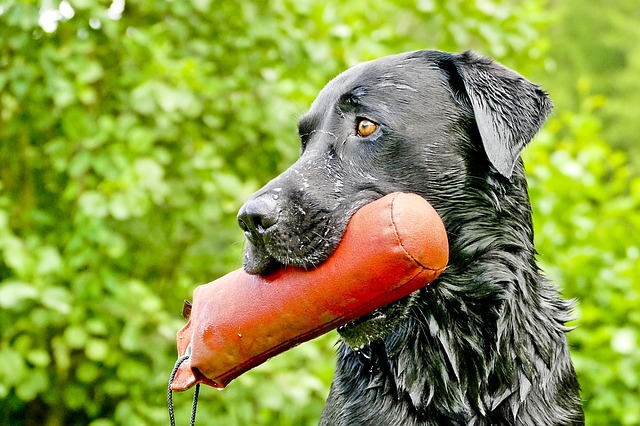 This difference can be monumental when a hunter is trying to develop a show ring dog – one that tends to be bulkier and less athletic – for hunting waterfowl.